Preservationists are hard at work in Russia, but development, climate change and industry pollutants are working faster. So many historic places, if they exist at all, are mere remnants of their former beauty. Russia has its endangered gems that are definitely worth visiting just to keep them alive--at least in your memory. Firstly, these woodlands are magical. The Virgin Komi Forests are ancient and relatively undisturbed, a landscape of Siberian firs, larch and spruce trees with velvet-like canopies and underbrush. They are among the last, old-growth undisturbed woodlands, and the first Russian natural site added to the UNESCO World Heritage list. The richest treasure of the Taiga, the Virgin Komi are home to more than 40 species of mammals, 16 types of fish as well as hundreds of rare bird species. The forests belong to the Ural Mountains Taiga ecoregion, which is about the size of the country of Belgium (32,800 km²). Despite the forests’ recognition as a World Heritage site, its future is threatened, and illegal logging and gold mining are the culprits. As a result of the drilling and blasting operations, some of the unique landscapes have been destroyed, while rivers and lakes are contaminated. Greenpeace is lobbying to include the Virgin Komi Forests on the “World Heritage in Danger” UNESCO list. Ecotourism is encouraged in the woodlands, and you can find more information about getting there, as well as types of accommodation here. The small (only 0.5 square meters) rocky island in Avacha Bay (Kamchatka Peninsula, Russian Far East) is a natural reserve bustling with life, home to 44 colonies of 11 maritime birds species. The total number of birds living on Starichkov Island exceeds 50,000. The Island—its name means “old people”--has been a reserve since 1981, when an enclave of ornithologists from the Russian Academy of Science conducted scientific observations on the island. But Starichkov has been gravely affected by industrial fishing off its shores. The waters also became a military dumping ground of sorts, as personnel on the bases for the Russian Military Fleet dropped scrapped weapons’ ammunition in the water. Many species of rare maritime fish and crabs are almost extinct as a result of an imbalanced ecosystem, which in turn has had a detrimental effect on the bird populations. Ecotourism is allowed, visit this website for more information. For many foreigners, the most quintessentially Russian places are rustic villages with wooden churches or small wooden izbas (houses) with nalichniki, embellished window frames in lively colors. (Some expatriates even took these window treatments and doors with them off of distressed buildings, to some controversy.) Yet a mass exodus of residents from rural regions in northern Russia has destroyed more wooden buildings than either wars or vandalism. Scores of ancient wooden churches have been lost: Some have been left to rot, while others were destroyed by weather and neglect. Some wooden architecture has been saved by advocates and preservationists. They often work against the tide, however, as more houses and churches fall into disrepair. Yet evocative outdoor museums have preserved examples of this architecture. Tourists who want to see these spectacular wooden churches and homes in remote settings can visit the Malye Karely collection near Arkhangelsk. The five-domed Church of the Ascension and other gems of 17th century architecture have found a picturesque new home here. There are windmills and animals, folk celebrations and concerts to round out the activities. Also, The Vitoslavitsy Museum near Veliky Novgorod is another great collection in a spectacular setting. 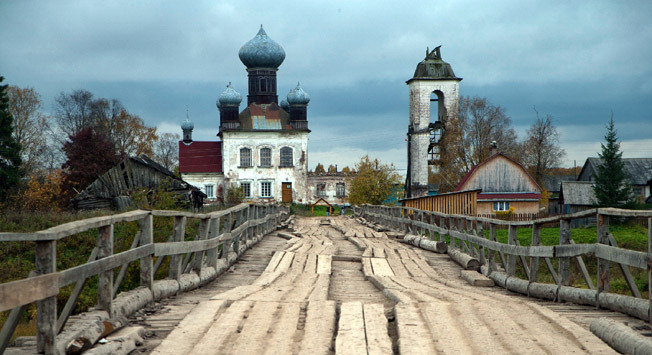 Restored wooden buildings from across the region are arranged on the marshy shore of the Volkhov River. Lastly, Kizhi church complex (known as the Kizhi Pogost) was one of the first Russian sites to make the World Cultural Heritage list by UNESCO. For most Russians, the island of Kizhi is the epitome of medieval wooden architecture: using no other tool but the carpenter's axe, unknown craftsmen created breathtaking masterpieces. Lake Baikal is a world unto itself. Exquisitely isolated, it is the oldest and deepest freshwater lake, inhabited by thousands of species of birds, animals, plants, fish and microorganisms – many of which are not found in any other stretch of water in the world. Secured by the Baikal Mountains, from north to south the lake is 636 kilometers around (395 miles) – the distance between Moscow and St Petersburg. Two thirds of the life on, around and in Lake Baikal cannot be found in any other body of water on the planet. Angara River, which drains Lake Baikal, is 1,229 kilometers long (1,105 miles). Not long ago it was considered one of the cleanest rivers in the world, but already today it is impossible to drink water from the river without boiling it, and in some regions it is prohibited to eat the fish caught in Angara. The main reason for that is the activity of the cascade of Hydro Electro Stations built on the river in the Soviet era. Now there are four stations working on the river, and four more are under construction. According to the World Wildlife Federation (WWF), activity at the stations may not only contaminate the pristine waters of Lake Baikal and its fauna, but it also may hurt the Siberian Fir Forest on its shores. For more information about ecotourism on Lake Baikal, visit the official website. Vyborg, a town in the Leningrad region, has long been known as the borderlands between the Russian and Scandinavian worlds. These borders are historically fluid: The last time the area changed hands was in 1944, when it was taken by the Soviet Union from Finland during World War II. Russian, Swedish and Finnish hands have molded the city and its buildings– sometimes bolstering each other’s work, and at other times erasing it. For the past half-century, Vyborg has been left to deteriorate. Old buildings languish in states of distress and disrepair, unfit for use. Often these historic buildings are torn down by investors under the pretext of concern for their hazardous conditions. But they are clearing the way for new developments. Architects and preservationists have organized in recent years to stop or at least slow the destruction of the city's architectural heritage. Currently there's a feeling that almost everything in Vyborg is under the threat of demolition – from 15th-century Swedish buildings to Finnish apartment houses of the 1930s. Again, these are good reasons to visit Vyborg soon – before it becomes a memory of what once was. To visit Vyborg check out this site.